As a winter project I'm working on a 4WD RC buggy. It will be heavily inspired by @agrof's Class 1 Ultimate Buggy, for I very much like the behaviour and the looks of that model. 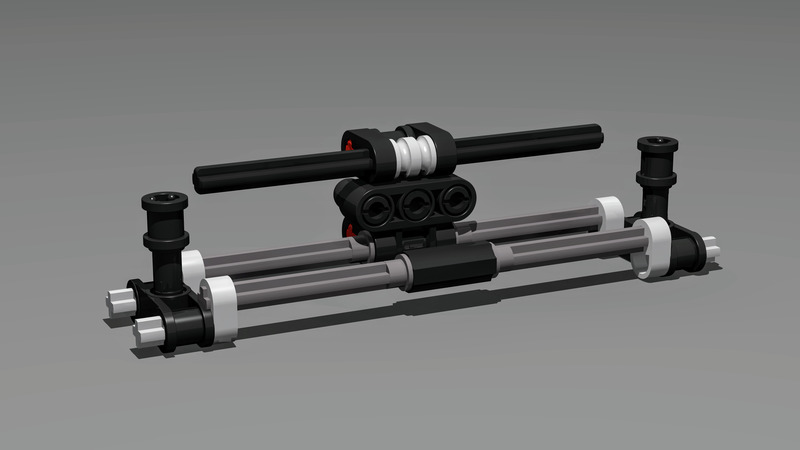 With this model I will also deliver to my promise to @DugaldIC to make an RC model. I was planning on finishing this MOC without a WIP topic, but I simply can't work without the feedback . 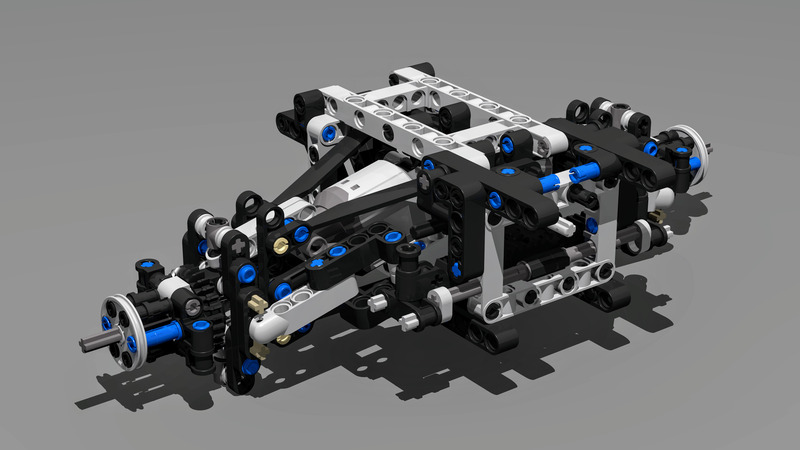 It will have 4 L-motors and 1 servo motor. No buggy motors, for I will be using current-date parts only. Control will be done with SBrick. 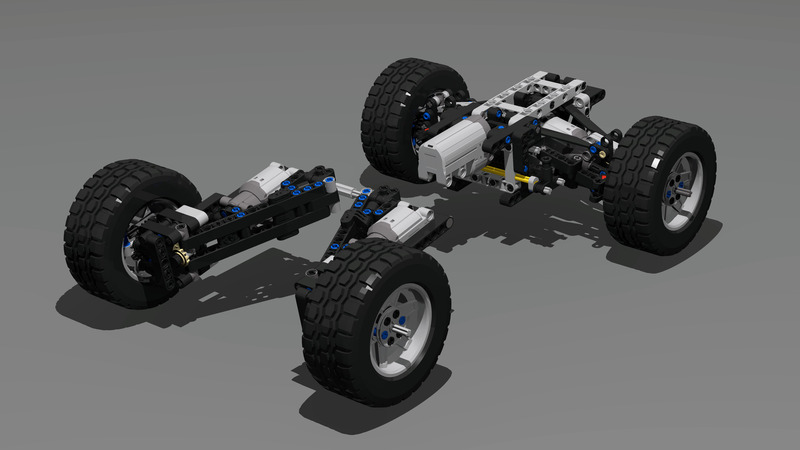 Sofar I have been working on the axles. Sofar I have only been designing digitally, but I did check the most essential constructions in real life already. I will show progress when ever I have something to show. If you have any comments, feel free to reply. I'm new to motorized building so I can use some feedback. Holy god, that thing is going to have POWER! I can't wait to see how this progresses! 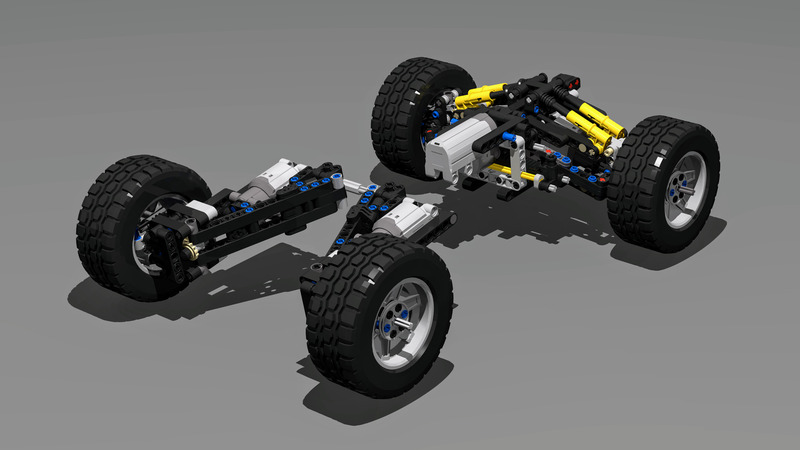 I like the progress, but how does the front suspension work? That will be a pretty agile thingy, I can see this on pair with Madoca's Trophy Truck in performance! Can be a very cool Ultra4 Buggy (I know those have usually live axles on the rear - but let's stick to artistic freedom ), I would only swap the tires for Unimog ones, they just look better (more authentic) due to the profile. 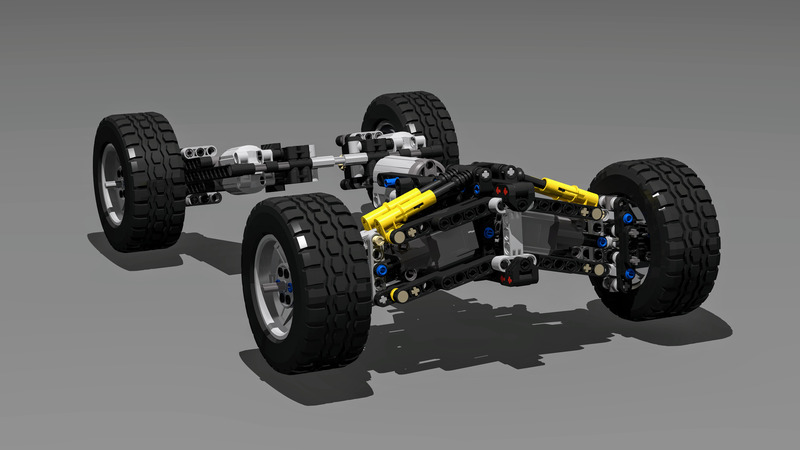 I can imagine pushrod system for the suspension, looks brutal so far, it is even fun to discover all the connections and part usage. You have definitely my attention! Very interesting design so far!! I'm quite interested to see how this will shape up. I will follow closely. I noticed you have this ability to create L-beams on any ange and it just seems to work so well for your builds. Of course the added strength to your framework. Great start, can't wait to see the final product! 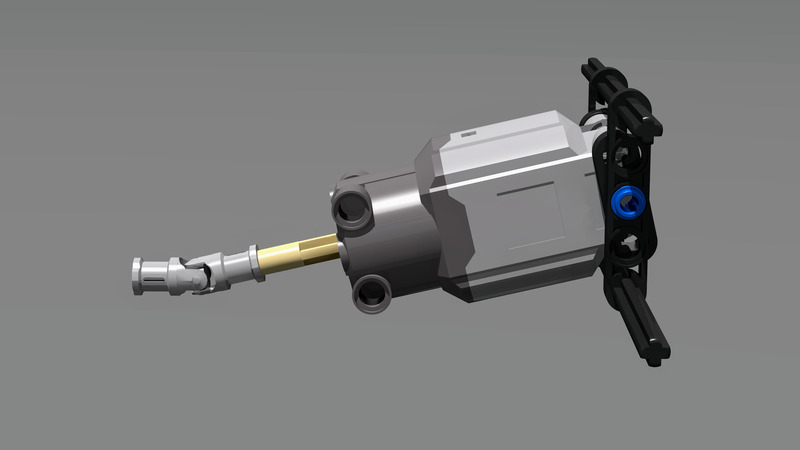 There will be large shocks on top of the upper wishbone, push-rod style. I'm thinking of pairing hard (yellow) and soft (grey) shocks for each wheel. 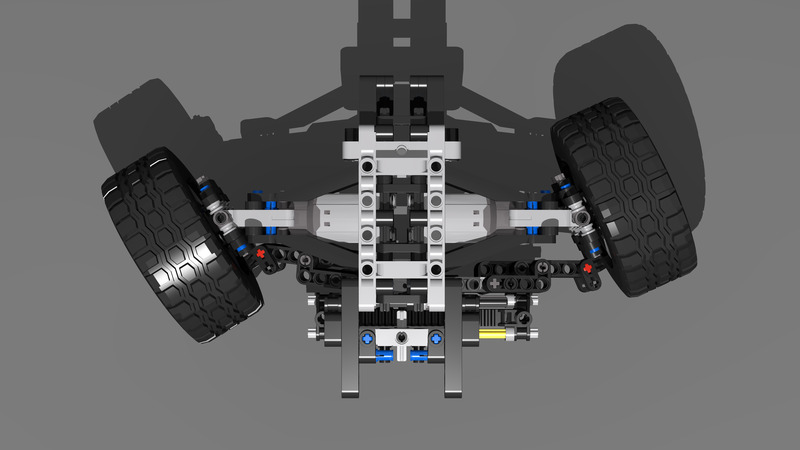 Btw, the wishbones of the front suspension are 11L long! It looks large, but the track width is only one stud wider than agrof's buggy. This is due to the custom wheel hubs, which bring the wheels half a stud more outwards. Also the length is one stud larger than agrof's buggy. Thanks @Lox Lego! It won't shape up as fast as your models, but I hope the final result will please you. 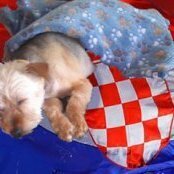 There is still one problem I need to solve in the frontaxles. It appears servo motors rotate only 90 degrees, clockwise and counterclockwise. That would give me 1L gear rack travel in each direction, which is not enough. So I will probably have to use a 20t gear to drive the gear rack instead of a 12t gear, but that is not very convenient. Either the gear rack or the gear needs to move half a stud. Looking good so far! It will be cool to see how fast it goes with 4 motors instead of 2. Will you modify the original body or create a completely new one? I honestly don't know yet. I usually have more fun with the chassis-part, so I might copy more ideas from the body eventually. 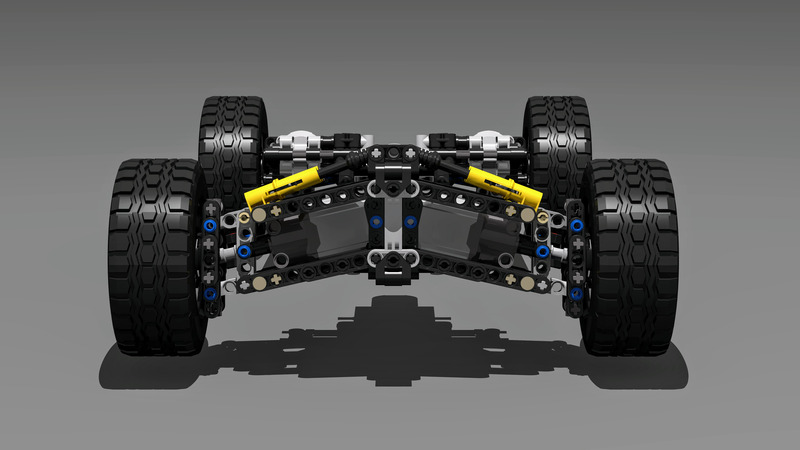 Did you modify the rear axles? I fixed the gear rack travel: I managed to lower the gear rack by half a stud so I can control it with a servo motor using a 20t gear. This will give me the required 1.5L travel. The gear rack has two sliders. A bit overkill, but it was the only way I could find, to lock the sliders properly. Everything needs to be rugged of course . Super cool build so far, I love your creativity, different approach to builds and this clearly no different. 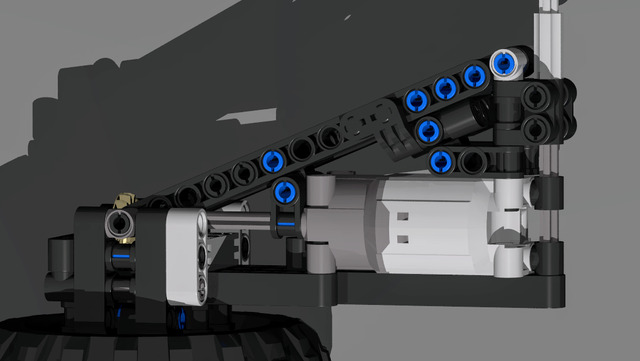 The way you've integrated the the motors into the suspension is awesome, definitely excited to see where this one goes. 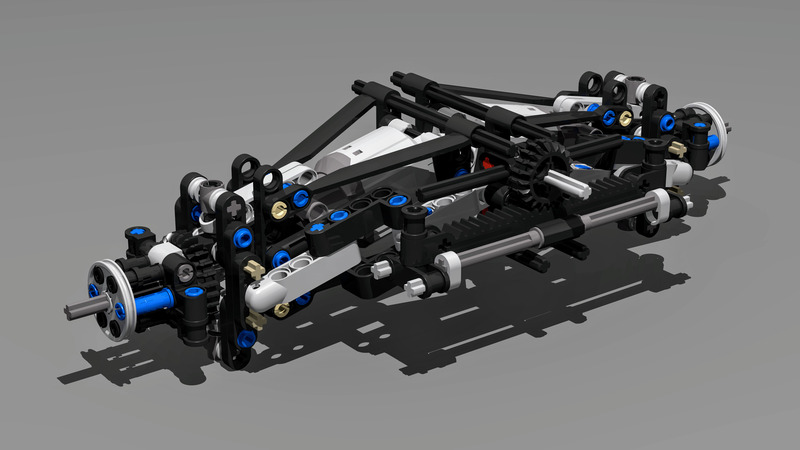 I havent tried getting two 5.5L axles in to a frame from the inside. I guess would need only a small amount of bend to get the second in? Looks great. Love seeing how you put pieces together so well. Second that, but luckily they can be swapped for sake of buildability. I am interested in rigidity of that solution, clever part usage though! Or just an 11L axle I guess. Thanks @DugaldIC. I hope it's all going to work out fine. I should replace it with a 11L axle. 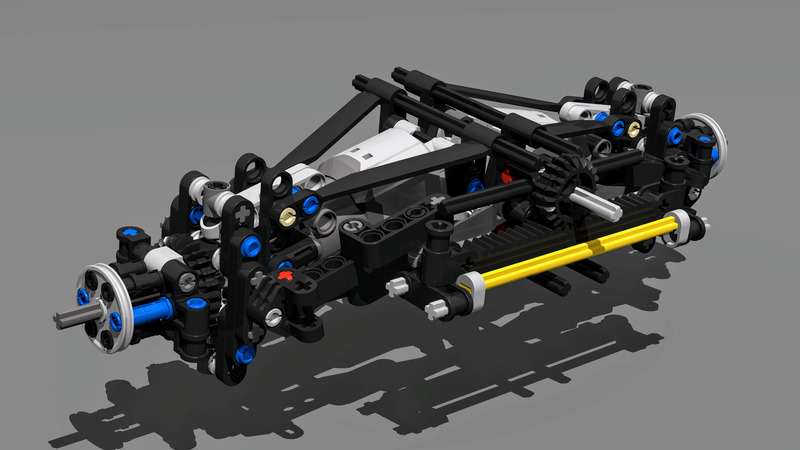 The two 5,5 axles at the other side of the rack should not be replaced, otherwise the assembly with the tow balls could slide over the axle. But luckily those don't run through a frame. I am interested in rigidity of that solution, clever part usage though! 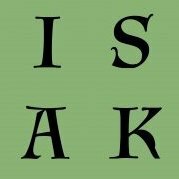 I hope to know more soon. 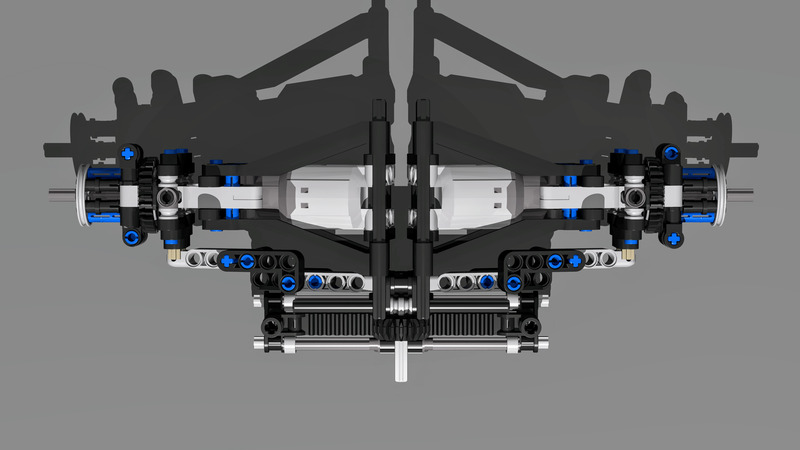 But I'm actually more concerned about the massive steering rods (with 4x2 liftarms) that can freely rotate, because they are attached to two balls at both ends. My guess is that it should work as they will first (and only) collide with the gear rack assembly which moves along with them. If all works out fine, the max steering angle should be 30 degrees. Something that would never be possible when making FWD with standard wheel hubs and CV-joints. That front top frame will limit suspension travel. I did get one in, but the second will never come out. Because of the cuts in the frame, they easily fit. Yes and it's not the only thing that limits the travel. 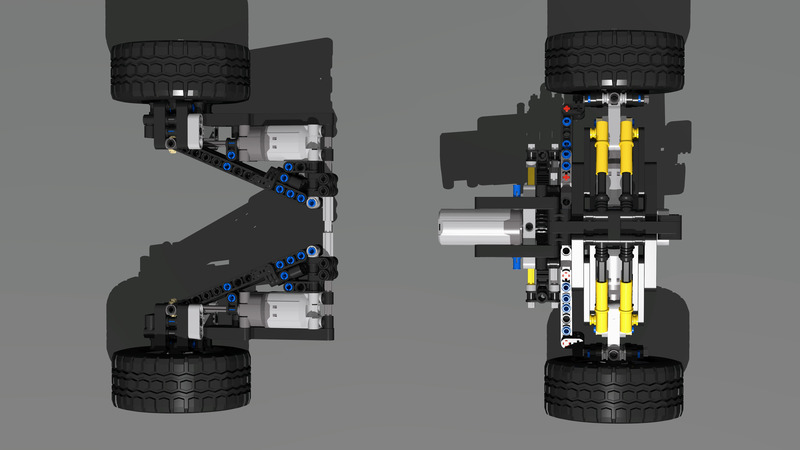 The LBG 5L suspension arms collide with the motors when the A-arms are inclined more than depicted in the renders. 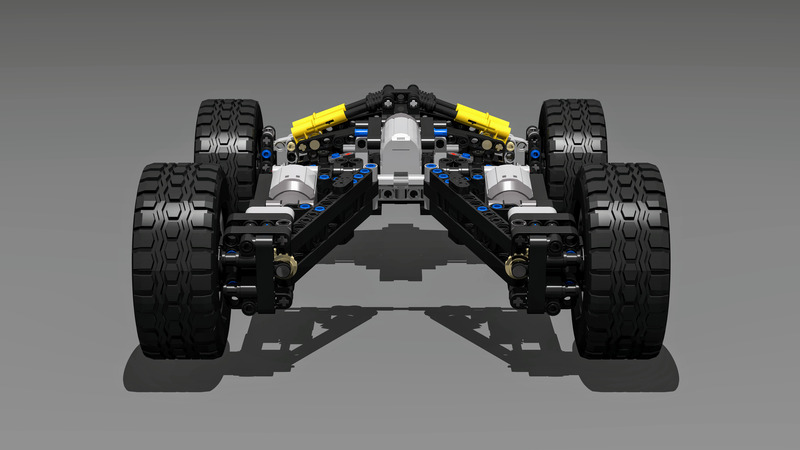 When held flat, the front axles have a ground clearance of 5L. The suspension travel is 4.5L, so when compressed completely, the bottom hangs 0.5L above the ground. 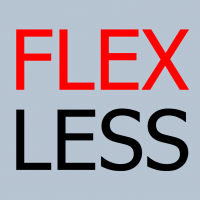 Nevertheless, when the frame on top will turn out to be the bottleneck, I will change it. Yes, the unsuspended weight is intended to increase performance. However, I would argue that the motors are not completely unsuspended. Their center of gravity sits much closer to the 'suspended side' of the A-arms than to the 'wheel-side' of the A-arms. My conclusion would be that the motors are less suspended, but not unsuspended. I agree I should include Ackermann steering. I looked into that before, but couldn't find a proper way to implement it without obstructing other requirements. 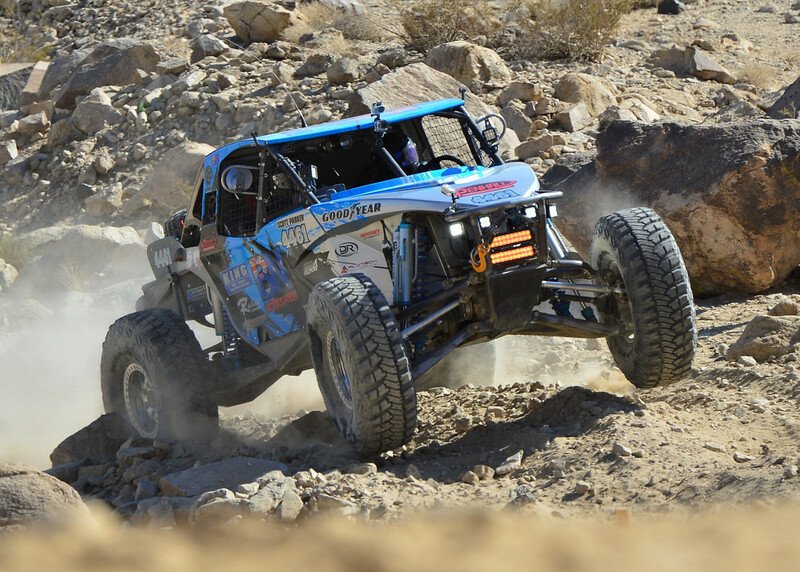 For instance, I don't like having steering links that are shorter than the A-arms, because that would result in toe-out when the suspension fully expands or fully compresses. 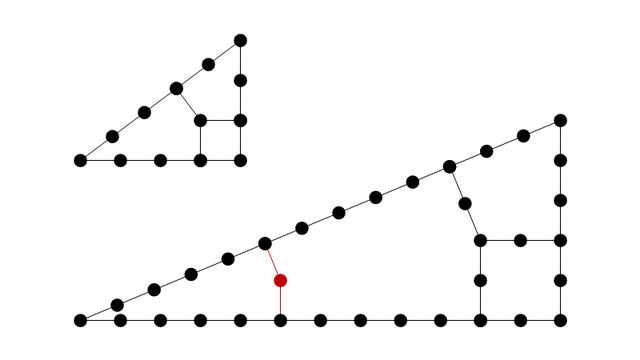 But I looked into it again and found a way to have Ackermann geometry without introducing toe-out. 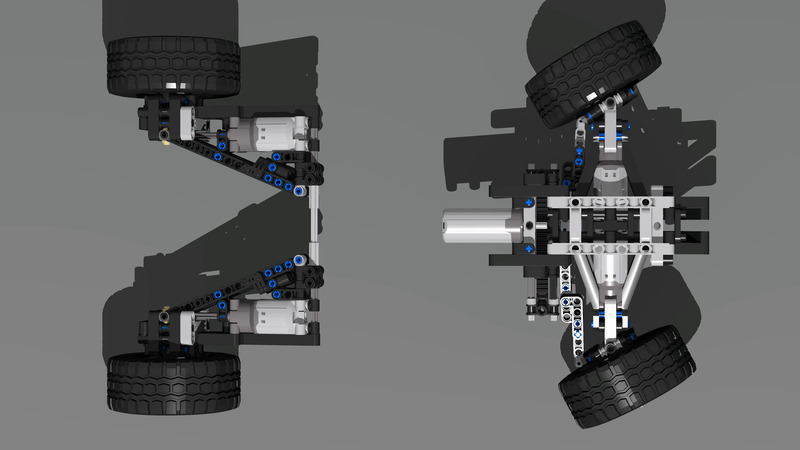 I could split the horizontal rotation and the vertical rotation of the connection between the steering rod and the wheel hub. My only concern with that is that the 2L pin without friction could come out easily and that the whole steering will suffer from more slack. 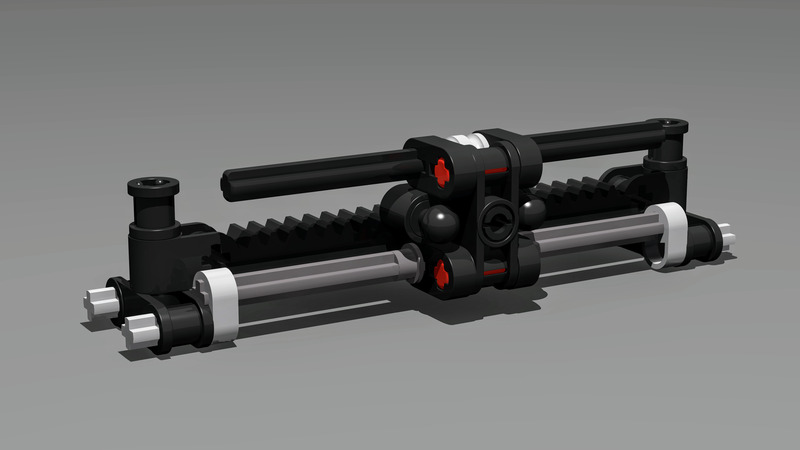 On the positive side, it does solve my issue with the massive steering rods being able to rotate freely. Their orientation is now defined by the position of the wheel hub. It would give about 32 degrees max steering angle for the inside turn and about 24 degrees for the outside turn. I am away from home now, so I can not check, but could be a solution to block the 2L frictionless pin by putting a 3L lightsaber piece into - if it fits, or similar (screwdriver, minifig accessories). With 2L friction pin it will for sure work, and I don't think it would effect the working too much. Tomorrow evening earliest I can show You examples, if needed. 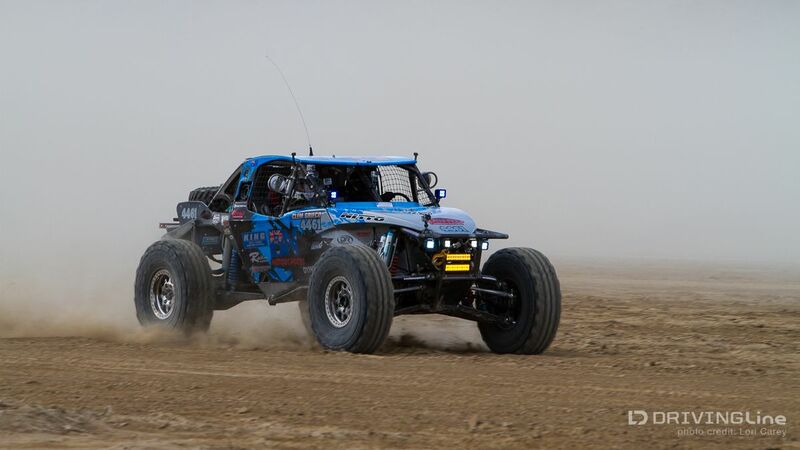 Wow, this buggy looks really exciting, will follow the build for sure! I'm confident it will drive well on rough terrain with the 4 L motors. As I see you'll use the direct output of the motors, I wonder if there's any possibility to gear it up a little bit for more speed (not sure if the gearing would fit for the front axle), it depends on the final weight as well. @Didumos69 If there is space, you could put a flick-missile pin with the bar facing towards the rack. Slip a 1/2 pin over it, and that should hold it really well. I've done this before, and usually need pliers to pull the pin off. It makes for an incredibly strong construction. @kbalage Based on the size, gearing up would reduce performance here. The L-motors wouldn't have the necessary torque.